A satellite telephone, satellite phone or satphone is a type of mobile phone that connects to other phones or the telephone network by radio through orbiting satellites instead of terrestrial cell sites, as cellphones do. The advantage of a satphone is that its use is not limited to areas covered by cell towers; it can be used in most or all geographic locations on the Earth's surface. Some satellite phones use satellites in geostationary orbit, which appear at a fixed position in the sky. These systems can maintain near-continuous global coverage with only three or four satellites, reducing the launch costs. The satellites used for these systems are very heavy (about 5000 kg) and expensive to build and launch. The satellites sit at an altitude of 35,786 kilometres (22,236 mi); a noticeable delay is present while making a phone call or using data services due to the large distance from users. The amount of bandwidth available on these systems is substantially higher than that of the low Earth orbit (LEO) systems; all three active systems provide portable satellite Internet using laptop-sized terminals with speeds ranging from 60 to 512 kbit per second (kbps). Geostationary satellite phones can only be used at lower latitudes, generally between 70 degrees north of the equator and 70 degrees south of the equator. At higher latitudes the satellite appears at such a low angle in the sky that radio frequency interference from terrestrial sources in the same frequency bands can interfere with the signal. Another disadvantage of geostationary satellite systems is that in many areas—even where a large amount of open sky is present—the line-of-sight between the phone and the satellite is broken by obstacles such as steep hills and forest. The user will need to find an area with line-of-sight before using the phone. This is not the case with LEO services: even if the signal is blocked by an obstacle, one can wait a few minutes until another satellite passes overhead, but a moving LEO satellite may drop a call when line of sight is lost. ACeS: This former Indonesia-based small regional operator provided voice and data services in East Asia, South Asia, and Southeast Asia using a single satellite. It ceased operations in 2014. Inmarsat: The oldest satellite phone operator, a British company founded in 1979. It originally provided large fixed installations for ships, but has recently entered the market of hand-held phones in a joint venture with ACeS. The company operates eleven satellites. Coverage is available on most of the Earth, except polar regions. 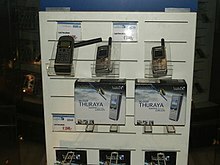 Thuraya: Established in 1997, United Arab Emirates-based Thuraya's satellites provide coverage across Europe, Africa, the Middle East, Asia and Australia. MSAT / SkyTerra: An American satellite-phone company that uses equipment similar to Inmarsat, but plans to launch a service using hand-held devices in the Americas similar to Thuraya's. Terrestar: Satellite-phone system for North America. ICO Global Communications: An American satellite-phone company which has launched a single geosynchronous satellite, not yet active. LEO satphones utilize satellites in low Earth orbit (LEO). The advantages include providing worldwide wireless coverage with no gaps. LEO satellites orbit the Earth in high-speed, low-altitude orbits with an orbital time of 70–100 minutes, an altitude of 640 to 1120 kilometers (400 to 700 miles), and provide coverage cells of about (at a 100-minute orbital period) 2800 km in radius (about 1740 mi). Since the satellites are not geostationary, they move with respect to the ground. At least one satellite must have line-of-sight to every coverage area at all times to guarantee coverage. Depending on the positions of both the satellite and terminal, a usable pass of an individual LEO satellite will typically last 4–15 minutes on average; thus, a constellation of satellites is required to maintain coverage (as is done with Iridium, Globalstar, and others). Two such systems, both based in the United States, started in the late 1990s, but soon went into bankruptcy after failing to gain enough subscribers to fund launch costs. They are now operated by new owners who bought the assets for a fraction of their original cost and are now both planning to launch replacement constellations supporting higher bandwidth. Data speeds for current networks are between 2200 and 9600 bit/s using a satellite handset. Globalstar: A network covering most of the world's landmass using 44 active satellites. However, many areas are left without coverage, since a satellite must be in range of an Earth station. Satellites fly in an inclined orbit of 52 degrees, so polar regions cannot be covered. The network went into limited commercial service at the end of 1999. Iridium: A network operating 66 satellites in a polar orbit that claims coverage everywhere on Earth. Commercial service started in November 1998 and fell into Chapter 11 bankruptcy in August 1999. In 2001, service was re-established by Iridium Satellite LLC. Radio cross-links are used between satellites to relay data to the nearest satellite with a connection to an Earth station. LEO systems have the ability to track a mobile unit's location using Doppler-shift calculations from the satellite. However, this method can be inaccurate by tens of kilometers. On some Iridium hardware the coordinates can be extracted using AT commands, while recent Globalstar handsets will display them on the screen. Most VSAT terminals can be reprogrammed in-field using AT-commands to bypass automatic acquisition of GPS coordinates and instead accept manually injected GPS coordinates. In some countries, possession of a satellite phone is illegal. Their signals will usually bypass local telecoms systems, hindering censorship and wiretapping attempts, which means they are problematic for countries heavily affected by terrorist activity as many groups use satellite phones to avoid detection when planning their attacks. It is also common for restrictions to be in place in countries that are run by oppressive governments regimes as a way to both expose subversive agents within their country and maximize the control of the information that makes it past their borders. These countries tend to score low on the Democracy Index, with the exception of India. China – Inmarsat became the first company permitted to sell satellite phones in 2016. China Telecom began selling satellite phones in 2018 and six other satellite phone companies expressed their interest in entering the Chinese market shortly after. India – only Inmarsat-based satellite services are permitted within territories and areas under Indian jurisdiction. Importation and operation of all other satellite services, including Thuraya and Iridium, is illegal. International shipping is obliged to comply with Indian Directorate-General of Shipping (DGS) Order No. 02 of 2012 which makes the unauthorised import and operation of Thuraya, Iridium and other such satellite phones illegal in waters which are within Indian jurisdiction. The legislation to this effect is Section 6 of Indian Wireless Act and Section 20 of Indian Telegraph Act. International Long Distance (ILD) licences and No Objection Certificates (NOC) issued by Indian Department of Telecommunications (DOT) are mandatory for satellite communication services on Indian territory. North Korea – The Bureau of Diplomatic Security advises travelers that they have "no right to privacy in North Korea and should assume your communications are monitored" which excludes the possibility of satellite phone technology. Russia – in 2012, new regulations governing the use of satellite phones inside Russia or its territories were developed to fight terrorism by enabling the Russian government to intercept calls. These regulations allow non-Russian visitors to register their SIM cards for use within Russian territory for up to six months. All modern satellite phone networks encrypt voice traffic to prevent eavesdropping. In 2012, a team of academic security researchers reverse-engineered the two major proprietary encryption algorithms in use. One algorithm (used in GMR-1 phones) is a variant of the A5/2 algorithm used in GSM (used in common mobile phones), and both are vulnerable to cipher-text only attacks. The GMR-2 standard introduced a new encryption algorithm which the same research team also cryptanalysed successfully. Thus satellite phones are not recommended for high-security applications. Some satellite phone networks provide a one-way paging channel to alert users in poor coverage areas (such as indoors) of the incoming call. When the alert is received on the satellite phone it must be taken to an area with better coverage before the call can be accepted. Globalstar provides a one-way data uplink service, typically used for asset tracking. Iridium operates a one-way pager service as well as the call alert feature. While it is possible to obtain used handsets for the Thuraya, Iridium, and Globalstar networks for approximately US$200, the newest handsets are quite expensive. 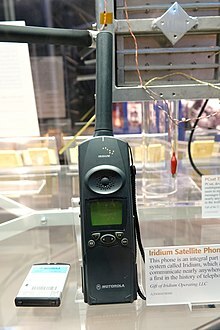 The Iridium 9505A, released in 2001, sold in March 2010 for over US$1,000. Satellite phones are purpose-built for one particular network and cannot be switched to other networks. The price of handsets varies with network performance. If a satellite phone provider encounters trouble with its network, handset prices will fall, then increase once new satellites are launched. Similarly, handset prices will increase when calling rates are reduced. Among the most expensive satellite phones are BGAN terminals, often costing several thousand US dollars. These phones provide broadband Internet and voice communications. Satellite phones are sometimes subsidised by the provider if one signs a post-paid contract, but subsidies are usually only a few hundred US dollars or less. Since most satellite phones are built under license or the manufacturing of handsets is contracted out to OEMs, operators have a large influence over the selling price. Satellite networks operate under proprietary protocols, making it difficult for manufacturers to independently make handsets. Satellite phones are usually issued with numbers in a special country calling code. Inmarsat satellite phones are issued with codes +870. In the past, additional country codes were allocated to different satellites, but the codes +871 to +874 were phased out at the end of 2008 leaving Inmarsat users with the same country code, regardless of which satellite their terminal is registered with. Low Earth orbit systems including some of the defunct ones have been allocated number ranges in the International Telecommunications Union's Global Mobile Satellite System virtual country code +881. Iridium satellite phones are issued with codes +881 6 and +881 7. Globalstar, although allocated +881 8 and +881 9 use U.S. telephone numbers except for service resellers located in Brazil, which use the +881 range. Small regional satellite phone networks are allocated numbers in the +882 code designated for "international networks" which is not used exclusively for satellite phone networks. The cost of making voice calls from a satellite phone varies from around $0.15 to $2 per minute, while calling them from landlines and regular mobile phones is more expensive. Costs for data transmissions (particularly broadband data) can be much higher. Rates from landlines and mobile phones range from $3 to $14 per minute with Iridium, Thuraya and Inmarsat being some of the most expensive networks to call. The receiver of the call pays nothing, unless they are being called via a special reverse-charge service. Making calls between different satellite phone networks is often similarly expensive, with calling rates of up to $15 per minute. Calls from satellite phones to landlines are usually around $0.80 to $1.50 per minute unless special offers are used. Such promotions are usually bound to a particular geographic area where traffic is low. Most satellite phone networks have pre-paid plans, with vouchers ranging from $100 to $5,000. Most mobile telephone networks operate close to capacity during normal times, and large spikes in call volumes caused by widespread emergencies often overload the systems when they are needed most. Examples reported in the media where this has occurred include the 1999 İzmit earthquake, the September 11 attacks, the 2006 Kiholo Bay earthquake, the 2003 Northeast blackouts, Hurricane Katrina, the 2007 Minnesota bridge collapse, the 2010 Chile earthquake, and the 2010 Haiti earthquake. Reporters and journalists have also been using satellite phones to communicate and report on events in war zones such as Iraq. Terrestrial cell antennas and networks can be damaged by natural disasters. 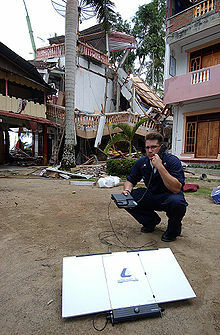 Satellite telephony can avoid this problem and be useful during natural disasters. Satellite phone networks themselves are prone to congestion as satellites and spot beams cover a large area with relatively few voice channels. ^ "New Satellite Phone Runs Windows Mobile". Gearlog. Archived from the original on January 1, 2010. ^ "CTIA 2008: MSV Makes "Lost" Satellite Phone Real". Gearlog. Archived from the original on January 3, 2010. ^ "Delay/Disruption-Tolerant Network Testing Using a LEO Satellite" (PDF). NASA. Archived (PDF) from the original on March 4, 2016. ^ Jaejoo Lim; Richard Klein; Jason Thatcher (2005). "Good technology, bad management: A case study of the satellite phone industry" (PDF). Journal of Information Technology Management. Association of Management. XVI (2). ISSN 1042-1319. Archived (PDF) from the original on September 23, 2010. ^ "Archived copy" (PDF). Archived (PDF) from the original on March 4, 2016. Retrieved February 24, 2016. CS1 maint: Archived copy as title (link). ^ "Globalstar GSP-1700 manual" (PDF). Retrieved August 1, 2009. ^ Hossain, Moazzem (September 24, 2002). "Bangladesh jails Indian rebel chief". BBC News. Archived from the original on May 18, 2009. Retrieved January 4, 2010. ^ "How illegal sat phones are a big headache for intelligence agencies". Rediff. Archived from the original on November 14, 2017. Retrieved November 13, 2017. ^ "Countries Where Satellite Phones Are Banned or Restricted". Blog - Telestial. November 8, 2017. Archived from the original on November 14, 2017. Retrieved November 13, 2017. ^ Dobie, Michael (September 28, 2007). "Junta tightens media screw". BBC News. Archived from the original on February 18, 2009. Retrieved January 4, 2010. ^ "Inmarsat given approval for IsatPhone 2 in China - Inmarsat". Retrieved August 30, 2018. ^ "China Telecom offers satellite phone services". Retrieved August 30, 2018. ^ "Satcom companies willing to partner with China to gain market access". Retrieved August 20, 2018. ^ Administrator. "SHIPMENTS SHALL NOT CONTAIN". co.cu. Archived from the original on May 13, 2014. ^ "Subject: Illegal use of Satellite Phones in India – regarding". Archived from the original on February 8, 2014. Retrieved January 28, 2015. ^ "Recommendation: Telecom Regulatory Authority of India". trai.gov.in. Archived from the original on February 13, 2015. ^ "Restrictions on the use of Satellite Phone – Carrier Services – Licensing – Department of Telecommunications". dot.gov.in. Archived from the original on January 18, 2015. ^ "INMARSAT – Carrier Services – Licensing – Department of Telecommunications". dot.gov.in. Archived from the original on February 13, 2015. ^ "Travel Warning: North Korea". Archived from the original on April 24, 2018. Retrieved November 14, 2017. ^ "From Russia with Love: New Regulations for Satellite Phones in Russia". Outfitter Satellite Phones Blog. Archived from the original on November 2, 2013. ^ Benedikt Driessen; Ralf Hund; Carsten Willems; Christof Paar; Thorsten Holz (2012). "Don't Trust Satellite Phones: A Security Analysis of Two Satphone Standards" (PDF). 2012 IEEE Symposium on Security and Privacy. Archived (PDF) from the original on May 18, 2013. Retrieved April 28, 2013. ^ "Satellite Phone Rentals and Sales". Allroadcommunications.com. Archived from the original on February 19, 2011. Retrieved April 7, 2011. ^ "BlueCosmo BGAN Pricing". Bluecosmo.com. Retrieved April 7, 2011. ^ "Dialling codes – customer support". Inmarsat. Archived from the original on March 22, 2011. Retrieved April 7, 2011. Wikimedia Commons has media related to Satellite phones.